Two commercial fisherman in Morro Bay, California, saved a humpback whale's life after noticing the majestic animal was in distress. 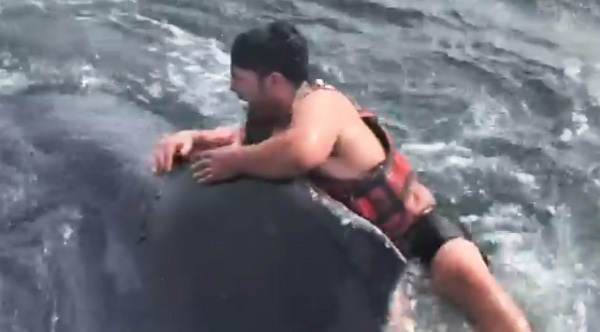 Nicholas Taron and Sam Synstelien were headed back to shore after a day of work when they noticed a humpback whale tangled in rope. "The whale was just swimming in counter-clockwise circles," Taron told KNTV. "You could tell he was stressed and being held to the bottom." They reported the distressed whale to the Coast Guard, who told them they wouldn't be able to respond for hours. So Taron and Synstelien took matters into their own hands. Synstelien mustered up the courage to jump onto the whale's back and cut the rope. Taron and Synstelien can be heard celebrating after Synstelien successfully cut the rope and the humpback takes a deep dive. "You are HEROES!!!" dulembadraws wrote on Instagram. "Love saves the day!" another wrote. "OMGOODNESS Sam!! Your so brave hats off to you for saving this beautiful creature," wrote another.